Time for YOU to be the teacher and give your coins a grade! Are you interested in collecting rare coins? If so, then you may have seen a number rating (ranging from 1-70) used to describe the condition of the coin. This number is called the coin’s “grade” — and just like your school grades, the higher the number the better the score. This scale is known as the Sheldon coin grading scale. It’s used to tell you about the condition of a coin before you or your parents buy it. Though this scale is useful once you understand it, it can be confusing for beginning coin collectors. 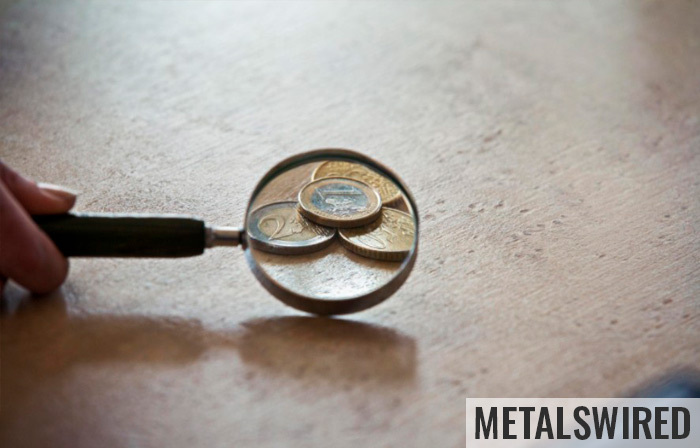 So if you’re new to the world of coin collecting, grab a magnifying glass, your coin collection, and scroll down to learn more how to find out the grade of your favorite coins. Coins in this category are barely identifiable because of too much damage or wearing. Design features may barely show which type of coin it is. The dates are unreadable. This grade is sometimes called “basal state” because it’s the lowest possible grade for a coin on the Sheldon scale. Slightly better than PO-1, a coin in FR-2 usually has a barely readable date and you can see a general outline of the design. Fine details are still completely worn down. Unlike the previous two grades, coins in AG-3 have some visible lettering other than the date. Some design detail is visible, though badly worn — especially in raised areas of the coin. You may or may not be able to read some of the lettering, but it should at least be visible. The date should be readable, though it can be quite worn. The coin’s design and date are visible, albeit heavily worn down and lacking in strong detail. Lettering should be somewhat visible. The rim of the coin is heavily worn, but should at least still be a recognizable feature. A coin that is slightly sharper in detail with a more pronounced rim than G-4 is graded as G-6. This grade implies that the coin is still heavily worn, but slightly above the basic condition requirements for a G-4 rating. Coins graded as Very Good should have a full, unbroken rim around them. Heavy wear will still obscure details of the design, but major features should be clear. At this grade, lettering is expected to be mostly readable. Coins with shallow lettering that are worn down faster can get a VG-8 rating with partial legibility. Coins that are sharper and more clear than a VG-8, especially if finer details can be seen, are given this rating. VG-10 coins are also more readable. Though coins graded in F-12 can still be visibly worn, they are expected to have full legibility and a lot of detail. At F-15, the sharpness of the feathers on an obverse (rear) design (in this case, the eagle) should be slightly less than half visible. A coin in Very Fine condition should be fully legible with clear, strong lettering. Wear can be light to medium, but no area should be so heavily worn that major details are obscured. The main difference between VF-20 and VF-30 is the wearing of raised points on the coin. A coin with medium wear on raised areas is designated VF-20. A coin with only light wear on raised areas is usually VF-30, assuming that no other unusual conditions downgrade it. In this grade, almost all wear should be on high points of the coin. Letters should be sharp and clear, with minimal wearing. All design details should be clearly visible. If a coin meets the criteria for XF-40 and the wear on high points is considered light, it can be upgraded to the higher XF-45 grade. To qualify as an AU-50, a coin should have very light wear on high points. It should also have at least some of its original reflective sheen or luster, though it isn’t necessary for the luster to be full. The criteria for AU-50 and AU-55 are the same, except that a coin graded in AU-55 must have at least half of its original luster, whereas an AU-50 can get by on less. In AU-58, a coin is practically indistinguishable from being uncirculated except to the trained eye and upon the closest inspection. Mint luster should be nearly full, and only the slightest traces of wear should be visible on raised areas. A coin in MS-60 is in mint state, but may be visually unattractive due to an incomplete strike or wear from being stacked or bagged with other coins. Ironically, AU-58 coins are sometimes considered more visually attractive, despite the fact they have seen some circulation. MS-63 refers to an average-looking uncirculated coin. A coin in MS-63 is expected to be free from the issues that plague an MS-60 coin. A coin with a good strike and no unusual marks to distract the eye from the design is said to be in MS-65. To qualify, a coin must still retain its full luster. To be MS-67 or higher, a coin must have its full mint luster and only the most minor of imperfections to detract from its condition. Extremely rare in coins produced for circulation, the MS-70 grade can only be conferred on a coin that is completely free of any flaws, marks or compromising of luster. A coin in this grade is completely perfect condition-wise and has no errors of any kind. We hope you enjoyed learning about how to grade a coin! Continue browsing our Kids Coin Corner for other fun and informative articles.